M.R.C. 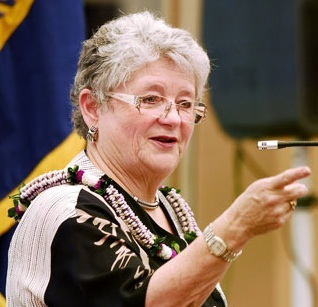 Greenwood, who drew high praise and strong criticism during her four years at the helm of the University of Hawaii system, has announced she will retire in September to spend more time with family and deal with her health problems. Star-Advertiser. University of Hawaii President M.R.C. Greenwood will retire this summer after four years as the head of the state’s university system. Pacific Business News. After a number of high profile battles with key Hawaii lawmakers in 2012 and 2013, University of Hawaii President M.R.C. Greenwood announced Tuesday she will retire in September, before her $475,000-plus annual contract with the University expires in 2015. Hawaii Reporter. University of Hawaii President M.R.C. Greenwood will retire in September, an announcement from the university Monday said. Maui News. University of Hawaii President M.R.C. Greenwood plans to retire two years before the end of her contract, a departure she claimed had nothing to do with the failed Stevie Wonder concert that brought her leadership under scrutiny. Hawaii News Now. 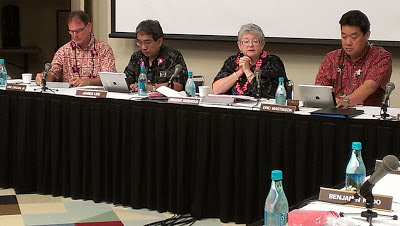 University of Hawaii President MRC Greenwood is resigning her post in September, according to Gov. Neil Abercrombie. KITV4. University of Hawaii President M.R.C. Greenwood announced on Monday — she’s retiring from the presidency in September, two years before her contract expires. KHON2. Hawaii's historic preservation agency has missed a major deadline for making federally mandated improvements to its program, and could still lose its federal certification and funding, officials said. Civil Beat. Unfair welfare: Investigation reveals $48.4 million in overpayments. KHON2. The Hawaii Association of Realtors was the top donor to Hawaii lawmakers in 2011 and 2012, with the association donating $110,100 to 83 percent of the state's 76 lawmakers. Hawaii Reporter. The new power granted Republicans in the state Legislature this year did not translate into getting caucus bills passed; many never received a hearing. Civil Beat. State Sen. Malama Solomon, former Department of Hawaiian Home Lands Commissioner Stuart Hanchett and about 20 other Native Hawaiians are members of an exclusive group. While on DHHL waitlists for ranching or farming homestead lots, they obtained month-to-month revocable permits for pastoral or agriculture land from the agency, according to a Star-Advertiser analysis of DHHL data. Kamehameha Schools CEO Dee Jay Mailer has announced plans to retire at the end of 2014, giving the school's board of trustees ample time to recruit a successor. Star-Advertiser. For most people who live in Hawaii, dealing with vog is just another part of daily life. But for those with breathing difficulties, volcanic smog can complicate health issues. Hawaii Public Radio. The names, email addresses, cellphone numbers and passwords for about 3,500 people who signed up for email or text message alerts from the Hono­lulu Police Department's former "HPD Alerts" system may have had their personal information compromised after the server was hacked by "an unauthorized person or persons" over the weekend. Star-Advertiser. HPD has confirmed one of their databases containing information about the public has been hacked. Officials say anyone who has ever signed up for an "HPD alert" using their email address or phone number has been exposed. Hawaii News Now. Angst abounds after last week’s joint announcement from Hawaii Gov. Neil Abercrombie and Honolulu Mayor Kirk Caldwell about demolishing the Waikiki Natatorium War Memorial, highlighting deep rifts that don’t appear to be going away anytime soon. Civil Beat. Federal budget cuts are forcing Pearl Harbor to cancel its July 4 fireworks and the Marine Corps to cancel its annual Bayfest event at Kaneohe Bay. Star-Advertiser. Dominic Yagong's and Jamae Kawauchi’s request to investigate the county’s Elections Division was part of a larger conspiracy to take over the county’s elections, an attorney argued Monday. West Hawaii Today. Both of the state’s 2013 U.S. Presidential Scholars attend school in Waimea — Zoe Sims at Hawaii Preparatory Academy and Paul Gregg at Parker School. West Hawaii Today. For the past 17 years, James and Jane Sakugawa have rented roughly 5,000 acres of ranch property on Maui from the Department of Hawaiian Home Lands. That is 80 percent of all land DHHL is leasing to tenants on that island through its revocable-permit program. Yet the Saku­ga­was are not Native Hawaiian beneficiaries. Star-Advertiser. As part of a statewide crackdown on distracted driving, Maui police officers gave out more than 1,000 citations to drivers using cellphones last month, nearly doubling the total for the previous four months. Maui News. Gov. Neil Abercrombie triggered a round of joy when he signed a check Monday for the Kaua‘i Philippine Cultural Center. Garden Island. The state Legislature has approved a bill authorizing the administration to issue up to $1.3 million in bonds to Sunrise Capital’s shrimp farm in Kekaha to protect its hatchery against shoreline erosion. Garden Island. A plan to update Kauai’s single-lane Opaekaa Bridge has officials and residents discussing how much of the bridge’s history should be preserved while structural changes are made to enhance safety. Associated Press. Kauai Island Utility Cooperative’s board of directors said Monday that it wants its 23,300 active members to offer their comments and ideas for the utility’s updated 2013-2025 strategic plan. Pacific Business News.